This month has seen a continuation of the work on the re-alignment of the road at the bottom end of Long Street with kerbing now installed. It may be some time before the road has its final surfacing but meanwhile lights are controlling the traffic on Long Street just above this work site. 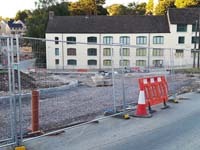 This part of town has changed significantly over the last ten years and the new road will make access easier to the increasing number of new houses on the Littlecombe site. With the Priory in the distance the re-alignment of Long Street to remove the sharp bend at the bottom can be clearly seen in this view of the street. 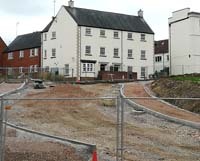 Viewed from outside the Priory this view shows the kerbing in place on the new road alignment in Long Street. 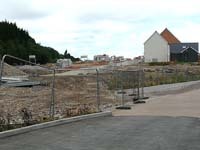 Viewed from outside Drake House, this view shows the new houses being erected near the Long Street end of the Littlecombe site. The 1937 R.A. Lister Fordson fire engine made a return to the Gloucestershire Extravaganza event this month and was resplendent in bright sunshine. This fire engine served the Lister factory for many years.